Ah, yes. That terrible last act of Thanksgiving night. The meal is over. Everyone is resting. Maybe having another piece of pie. Watching the third and final football game. And there you are. In the kitchen finishing off that turkey. It’s a tedious job and somebody has to do it. You, I guess, are somebody. What to do when you reach this point? Crush it. Just press down, break the critter into pieces, and put the pieces into a plastic bag. On Friday, open the bag and make turkey stock. Or, or, freeze and months later make the stock. Snowed in on a February day? Make stock. Now, that carcass means you have stripped away the meat. What to do with that meat? What to eat on the Friday after Turkey Day? Here’s a very lovely idea from HOT! by Judith Choate. This is her spin on classic mole with lots of chiles, almonds, seeds, spices, chocolate, avocado, and even maple syrup. If there is something else you would like to sneak it, I’m sure it would be welcome. I’m repeating this recipe from scratch and Judith wrote it assuming you using raw turkey, not leftovers. With leftovers, you can skip the cooking turkey part and get right to those chiles. Oh, yes. 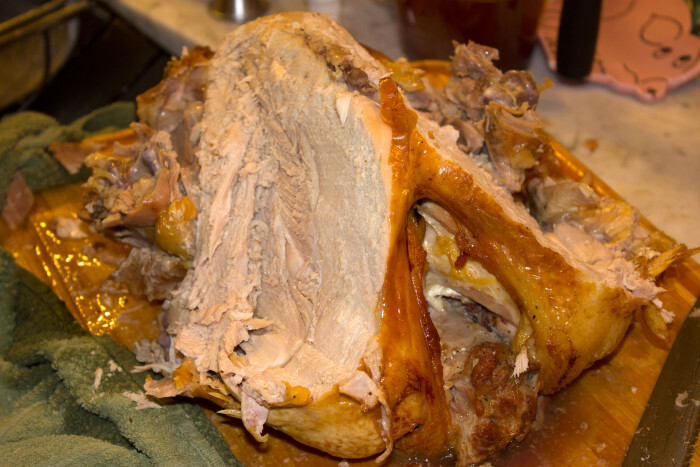 Look here on Friday and Saturday for more turkey leftover ideas! Wash turkey parts and pat dry. Heat 2 tablespoons oil in a heavy sauté pan over medium heat. When hot, add turkey and fry, turning frequently, for about 5 minutes or until turkey is well browned. Place browned turkey in a heavy saucepan. Add stock, water, salt, and pepper. Place over medium heat and bring to a boil. Lower heat and simmer for about I hour or until turkey has just cooked through. Drain, reserving broth. Set turkey aside. Cut chiles into pieces and place in hot water to just cover for about 30 minutes or until soft. Pour into a blender with the onion, % cup tomatoes, and garlic. Process until smooth. Add almonds, 2 tablespoons sesame seeds, spices, and tortilla quarters, and process until it is a coarse paste. Heat remaining oil in a heavy sauté pan over medium heat. When hot, add chile paste and sauté, stirring constantly, for 3 minutes. Stir in 2 cups turkey broth and cook for 3 minutes or until hot. Add chocolate and cook, stirring constantly, for 5 minutes or until chocolate has melted and sauce is thick. Taste and adjust seasonings with salt and pepper. Add maple syrup if sauce needs sweetening. Pull turkey from skin and bones. Lay meat in bottom of a 2-quart casserole. Pour sauce over the top, cover, and bake for about 20 minutes or until flavors are well combined. Remove from oven, uncover, and sprinkle top with sesame seeds. Keep warm.